Start up your production of cereal bars or produce smaller batches to test and try out new recipes. 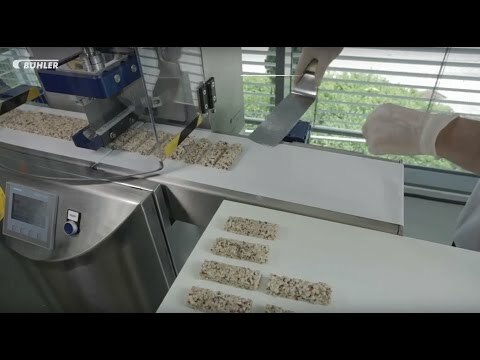 The SnackFix from Buhler Bepex is an entry-level automatic cereal bar production line that serves for simple production of cereal bars and similar masses. The SnackFix consists of only two main components and represents an entry-level model for bar production.The cereal mixture is continuously mixed with binder in the mass preparation unit. After mixing, the mass is delivered to the transport belt, formed to a continuous product slab by two equalizing roller and is then cut to the desired product width. The line is a perfect solution for producing cereal bars if a wide range with a throughput of up to 130 kg/hr. Both units can also be operated as stand-alone machines. The mass preparation unit can be continuously operated. The cross cutting unit can be used as an inexpensive forming and cutting line. For starting with automatic bar production, Buhler Bepex supplies more than just an entry-level automatic cereal bar production line. They provide everything – from delicious recipe ideas for granola bars to the ingredients for binder production.